Interra Systems' VEGA media analysis solution is a powerful tool for standards compliance, debugging, and stream interoperability. At NAB Show New York 2018, Interra Systems will show its industry-proven expertise in file-based workflows, and how OTT service providers can deliver exceptional content quality on every device. Beyond offering unified QC and monitoring solutions, Interra Systems plays a larger role in the digital media solutions space through innovations in artificial intelligence (AI) and machine-learning (ML) techniques, which will also be in the spotlight at the show. Demonstrations at NAB Show New York will explain to visitors how BATON ABR's exhaustive checks at pre- and post-transcode stages, along with ORION-OTT's comprehensive, delivery-specific checks and features, to assure exceptional QoE for every stream on every device. For live-event streaming, ORION-OTT offers a high-performance platform that can monitor multiple streams for ABR compliance along with audio-video quality checks in real time. The solution suite also supports closed captions, ad verification/compliance, and DRMs. Interra Systems will also demo BATON WINNOW, which expands the company's globally deployed BATON QC platform with an AI/ML-based feature set for content classification and compliance. This major BATON add-on brings the complete content QC and content classification workflow tools under one umbrella and improves efficiency. Seamlessly integrated with BATON, the new WINNOW add-on can be deployed in both cloud and on-premises solutions. Based on powerful content categorization algorithms, BATON WINNOW classifies audiovisual content based on specified criteria such as explicit scenes, violence, profane language, and more. WINNOW relies on user-defined rule sets to automatically check compliance and identification of content against regulations in different countries, regions, and organizations. The Interra Systems BATON demo will additionally show the industry's first support for the VAST protocol, hybrid QC workflows, as well as enhanced support for HDR content, audio language-detection capabilities, and much more. 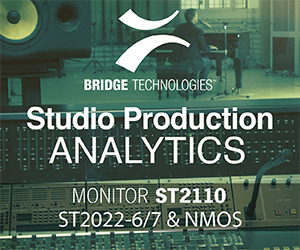 VEGA Media Analyzers assure standards compliance and provide debugging. Recent updates to the VEGA family include in-depth analysis of AV1 format, support for Windows 10, AV1, the latest HEVC HM reference code, HEVC-interlaced streams, VP9 streams (4:2:2, 4:4:4), PCAP streams, WebM, ALS Audio, Dolby AC-4 audio, and AVS Plus video. Newly added VEGA ABR software provides in-depth analysis, debug, and troubleshooting of complex ABR streams, making the solution an indispensable tool for checking the quality and integrity of manifest files and variants.